While Western Manitoba won't be getting a brewpub anytime soon, we do have a few options in our region. First off, if you don't mind going to the Gap (Saskatchewan), there's always the option of visiting the kind folks over at Bushwakker's, but for something a bit different, there's now the Souris River Brewing in Minot, North Dakota, which is a stone's throw away from Brandon, or about a 3 hour drive over the border, depending on wait times. Living on the prairies, 3 hour drive is NOTHING, I can do that in my sleep.. but don't ever try to drive in your sleep, it is insanely dangerous, even with it being incredibly flat in this neck of the woods! 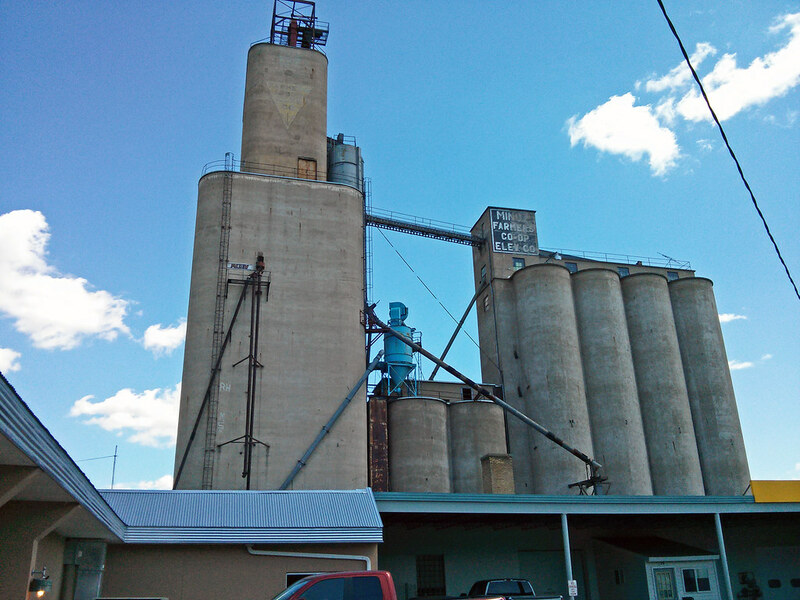 Brewery with a grain elevator next door? Brownie points! 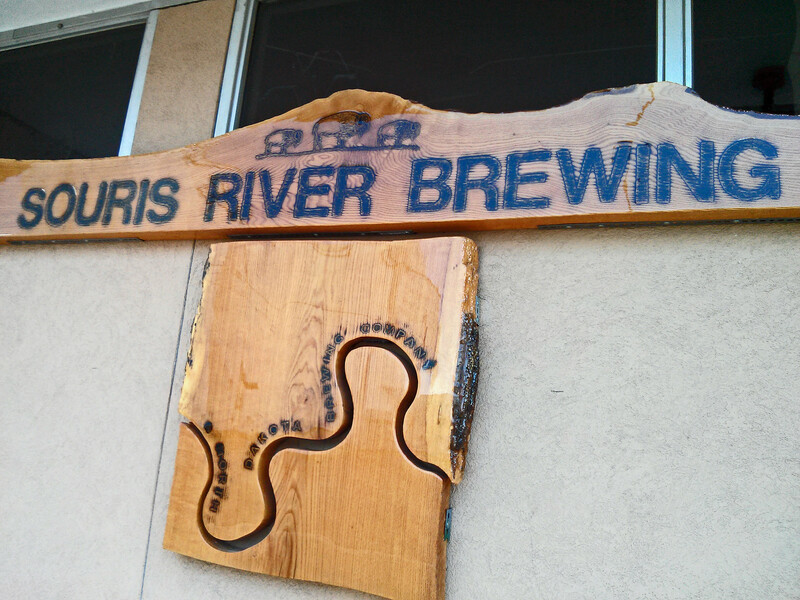 Souris River Brewing, the first brewpub in Minot opened up back in January and is already talk the town. Minot, like my neck of the woods near Hartney & Souris Manitoba were affected by the flooding of 2011, heck.. nearly all of my parents farm was under water for a whole year from the Souris River & Assiniboine floods, but Minot had the worst of it, having the flood wipe out hundreds of homes, businesses and making people homeless. Souris River Brewing was actually right in the heart of the flood zone, with its pub neighbour Ebeneezer's getting severely damaged, but the town rose up and got back to normal for the most part in a short period of time.. now that's community spirit! Just talking about beer with folks over at Marketplace Liquor on Broadway South as well as with some random locals, I was asked numerous times if I've visited yet, and of course - NOW I HAVE! Well back to SRB! Souris River isn't the first brewpub I've visited, but it's the very first I've visited that's within driving distance, so that's very new for me. With it being such a short drive away, I've been daydreaming of visiting since it opened, but it took until the ND State Fair to allow me to actually go. Arriving at the brewery.. er brew pub, it was your standard brewpub, a beautiful yet simple decor that I always love to see at my favourite watering holes. The walls are covered with nice old wood, a bit reminiscent of an rickety barn, a very airy, modern meets pub atmosphere and obviously.. lots of chatter going on between patrons, new visitors & regulars. A few seats down from me, there were two middle aged farmers looking around, sort of confused as it was their very first visit there. One of the old farmers said that he really prefers a Miller/Coors Light beer and can't handle strong dark beers so the bartender gave him a few samples of their lighter offerings, one being a standard lageresque pale ale (Souris River Swill) and a darker brown ale (East Brown and Down - a homage to the awesome TV show Eastbound & Down). The farmers both ended up preferring East Brown over the lighter Souris River Swill (great name by the way), it was interesting to see two farmers of my dad's age actually opening up and trying something different, instead of sticking with the same ol' standards - which they had available as well. I wish the server that was serving me gave me the option to try something so I could actually make up my damned mind.. so I would have been able to make up my mind damned sooner.. but my choices ended up being damned delicious. 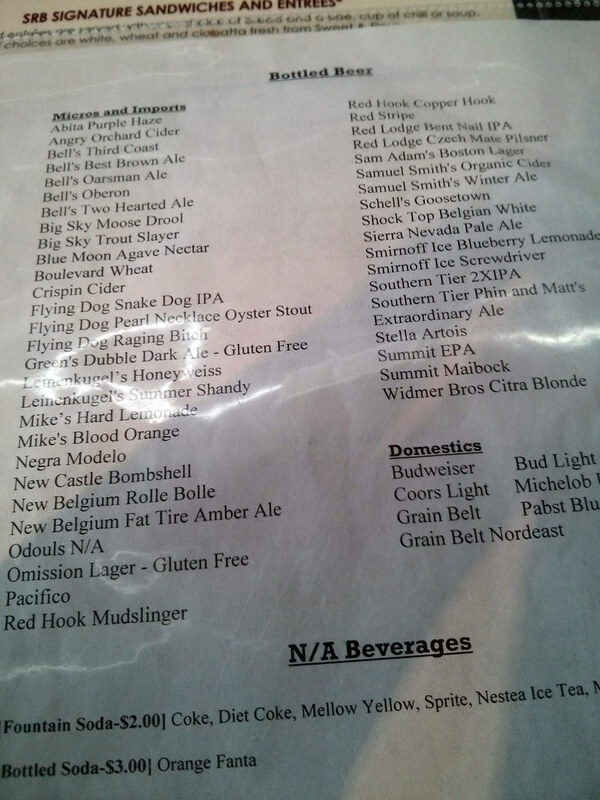 First off, I ordered the SaisoND Farmhouse Ale as I'm a saisonnière, love love LOVE saisons. I found the saison to look incredibly un-saisony because it turned out insanely thick, orangey and yeasty, appearing more like a chocolate milk stout rather than a saison as it.. apparently there was too much yeast being settled in the taps, but being a fan of overly yeasty Belgian style ales, I still enjoyed it as it had a great mixture of Belgian yeast, a nice sweet & citrusy backing and complimented the hot hot hot prairie afternoon thirst. FFOK Imperial IPA did NOT help me at all, with it being 8.1% ABV (and only $6ish for a pint) was one of the best Imperial India Pale Ales I've had in a long time, a very florally hopped IIPA with more of a malt front than hoppiness, so it turned out to be a sweet pineapple citrusy IIPA rather than a bitter West Coast Pine IIPA. According to a few other friends who have tried the FFOK, it's one of the best IIPAs they've ever had, and I can't disagree with them! 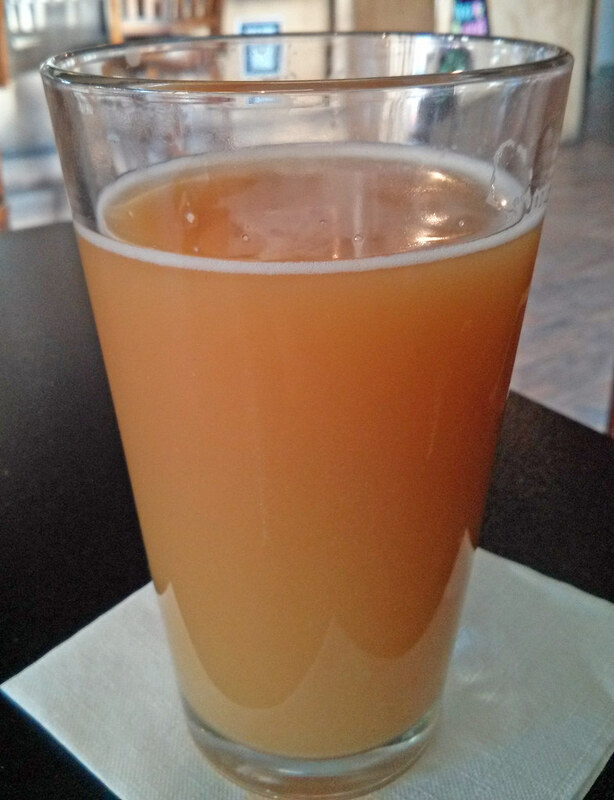 After a few minutes, I was starting to feel a light buzz, so I needed to settle down for a bit, but ordering this IIPA realllly didn't help, but hey.. when in Minot, amirite? Or more like Why Not, Minot?! The food was decent but depends on what you order. Their homemade burgers were some of the best I've had on the prairies - fresh baked buns right from Sweet & Flour Patisserie a few blocks over, local meats, homemade sauces and of course, North Dakotan cheese, what's not to love, right? 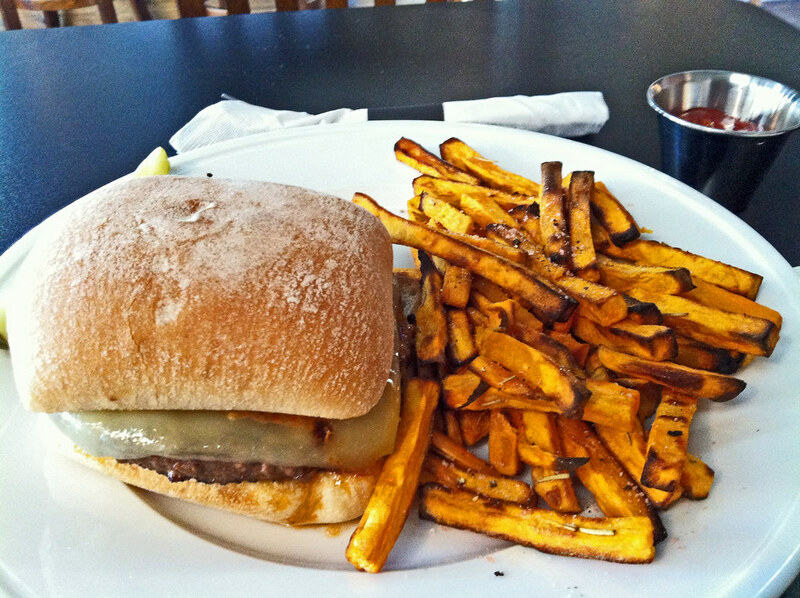 I ordered the bison burger and *drool* I could eat one per day for a long time and not get sick of it. However, the sweet potato fries were cold, burnt in the oven and tasted like frozen bag fries I could have gotten at home, but hey.. I came here for the beers! Service was hit/miss. The server at my table really couldn't recommend me any beers because they weren't a "fan of beers", which is kind of weird, being at a brewpub at all. However, one of the bartenders seemed to knew a LOT about beers as she was chatting it up with customers and able to describe what each and every beer tastes like in detail, and giving small samples so that people wouldn't end up ordering beers that could turn out tasting much worse than expected.. because hey.. not all of us love the taste of hops, some of us truly do like that Coors Light taste believe it or not... ah well. 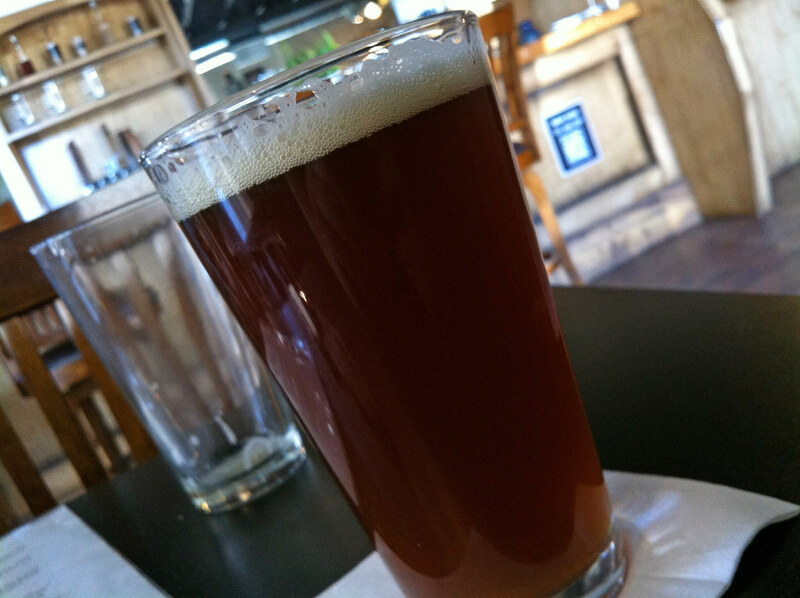 All in all, Souris River Brewing is a nice change of pace for this region of the prairies. Souris River Brewing will be the local brewery for us beer geeks here in Brandon, Manitoba for now while we wait for Farmery Estate Brewery to hurry up and build an actual brewery, SRB has a great selection of beers on tap that guarantee that even the fussiest of beer drinkers will be happy - if not, they do sell Coors Light, Bud Light and Grain Belt in bottles, though a brewpub should not have to cater to that market in the first place. If you make it out to the Minot area, check out Souris River Brewing, and hopefully one day they start selling bombers and selling their beers at the local Marketplace Liquor Store.